The design and construction of the appropriate building envelope is one of the most effective ways for improving a building’s thermal performance. 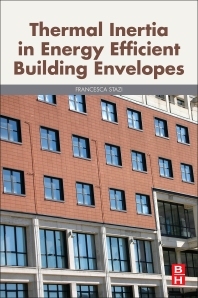 Thermal Inertia in Energy Efficient Building Envelopes provides the optimal solutions, tools and methods for designing the energy efficient envelopes that will reduce energy consumption and achieve thermal comfort and low environmental impact. Francesca Stazi, Ph.D, is Associate Professor at Polytechnic University of Marche. She carries out experimental and numerical research activities in the field of Building Science and Technology. The aim is to optimize the building envelope in terms of energy saving, thermal comfort, environmental sustainability and durability of the components. The researches cover new and existing envelopes, ventilated facades and passive solar systems. The acquired knowledge was applied in the patenting of two industrial inventions, an innovative ventilated thermal insulation and a GFRP frame for windows. The results of the studies are reported in 65 publications, including 25 papers on international ISI journals. She is also a reviewer for various international ISI Journals.